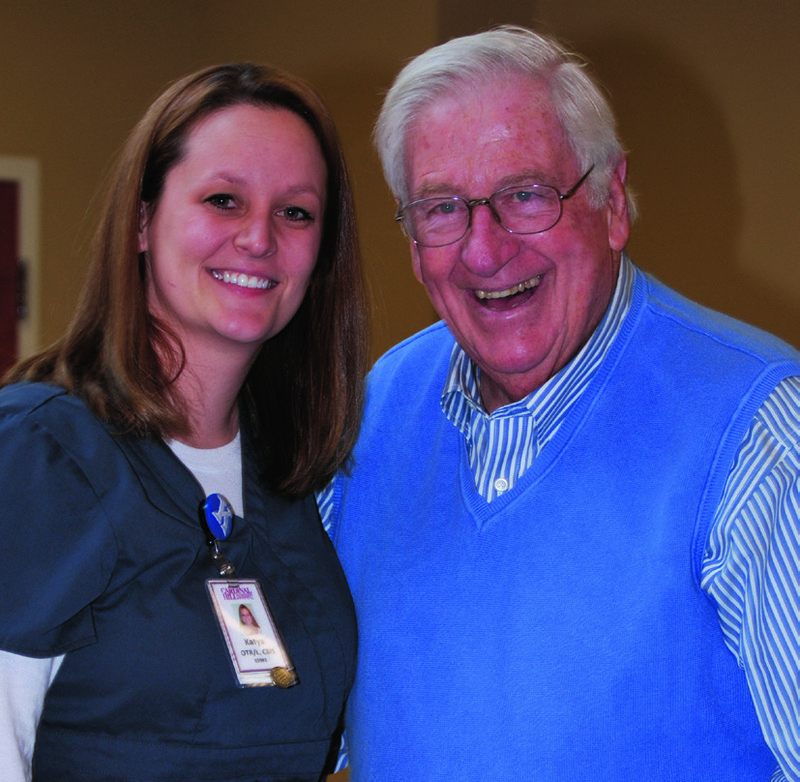 A former patient recalls how Cardinal Hill Stroke OT provided unique and supportive therapy. 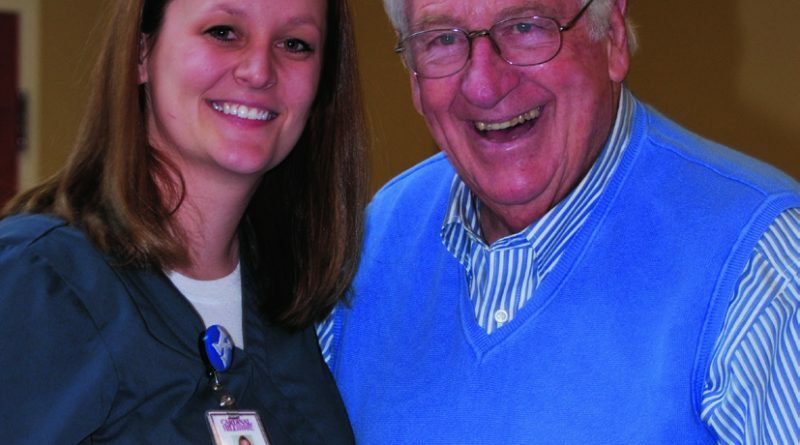 LEXINGTON I want to introduce you to a man who, since 2006, has had a knee replacement, an aortic valve replacement, two strokes, and now works three part time jobs – and he’s 74 years old. Pete de Castro of Georgetown attributes this renewed enthusiasm and engagement in life to his unique occupational therapy experiences, once in 2006 following knee replacement surgery and again in 2009 following stroke, at Cardinal Hill Rehabilitation Hospital. De Castro returned to Cardinal Hill after suffering first one mild and one more severe stroke during his recovery from aortic valve replacement. He was partially paralyzed on his left side and experiencing balance impairment. Occupational therapist Katya Winchell, MS, a certified brain injury specialist, recalls that de Castro presented with decreased balance in standing, decreased endurance for participating in desired tasks, and decreased gross and fine motor coordination in his left upper extremity. Working with Cardinal Hill physicians, Winchell developed de Castro’s OT regimen to focus first on regaining independence and completing desired occupations and tasks, such as dressing and completing household chores. During OT, de Castro would participate in a leisure task while standing to address his balance, endurance, strength and memory for path finding. Other times, he worked on gross and fine motor coordination of his upper extremities. Post stroke depression (PSD) is a common condition after stroke. Major depression occurs in nearly 33% of stroke patients; minor depression hits nearly 30% of stroke survivors. Many male stroke patients report depression as a result of having physical disabilities and limitations post stroke. De Castro says he was able to shake his PSD because of the constant support from Cardinal Hill staff and his family. One of de Castro’s favorite rehab programs was Pet Therapy Day in the Conservatory. Small animals, dogs, cats, and even goats were brought in for the patients to play with. “It was a petting zoo for grown-ups, and it was fun,” he says. Today, de Castro works 3–5 days a week as a tour guide at the Toyota Motor Manufacturing plant in Georgetown. He is a greeter at Keeneland Race Track every April and October, and he has his own flag business in which he displays flags at community events. Next April, you’ll find de Castro front and center when the Cardinal Hill Rehabilitation Hospital van pulls into Keeneland, treating patients to a day at the track. Pete will be there to greet them.